There was really no way that I was going to miss this event. I’m just hard wired to get on with it, regardless of how I feel and how much is stacked up against me. I’d also paid and I wasn’t going to be allowed a refund – what choice did I have? We abandoned the idea of caravanning when we heard that we were going to have to endure a couple of pretty nasty storms. Towing the van up in slightly breezy conditions can be a bit dodgy; attempting it in up to 60 mph winds would be just plain stupid. Thankfully The Caravan Club agreed with me and I got a really nice and understanding email from them. I booked our usual hotel on Leith waterfront for just £50 a room per night B&B. Total bargain, especially as they are happy to have Murphy there for no extra cost. We travelled up on Friday, had a nice lunch and dinner at the Ocean Terminal and caught a film in between. It was a nice start to the weekend. On Saturday morning I took the dog out for his early morning walk. Thank God I had him on his lead; it was so windy he might have taken off, kite-like, if I hadn’t got a hold of him. On top of this it was also extremely cold and was trying to sleet. We decided to leave the dog in the comfort of his snuggly bed in the car and go to the event ourselves. He’s not a bad weather dog and would have been turning himself inside out trying to get away from the cold and wet. I’d sorted out three possible buses to get us to the start in plenty of time. We aimed for the first one and missed that, faffing about with the dog, and so got the middle bus. Just as it drew up I realised that I didn’t have my gloves. “Never mind,” I said “I’ll wear my spare socks!” Cue raised eyebrows from hubbie. We arrived at Holyrood Park with half an hour to spare. I immediately joined a queue for the portaloos (which had been tied to the ground!) I can’t believe how long it takes some people to pee! The weather was closing in and the wind seemed to be funneling around Arthur’s Seat, the extinct volcano we were running up and around. 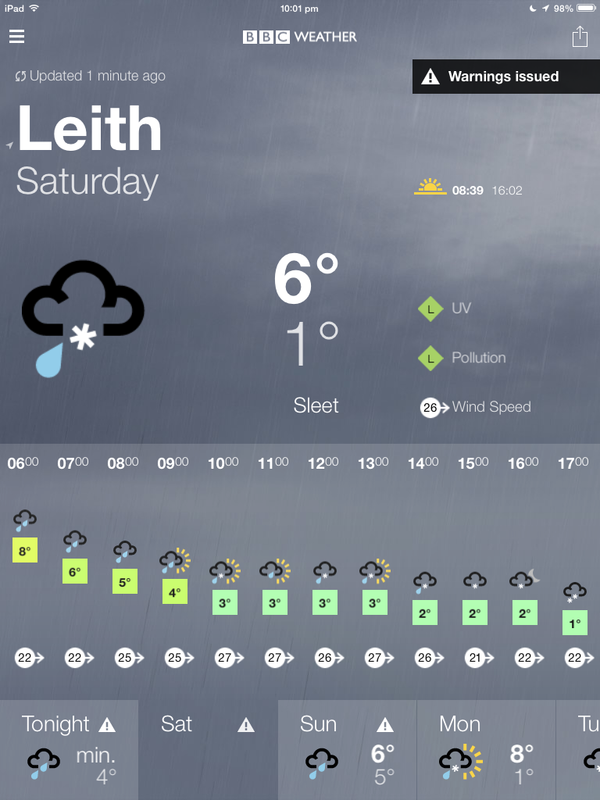 This wasn’t going to be a pleasant jog in the park! I was in the Green Wave and ended up right at the back of the corrall as there was only one entrance. I’d planned to be at the start of the corrall because usually what happens is that slow runners get to the front and then just clog up the hill section of the course, walking side by side and not allowing anyone to get past. It’s difficult enough, without having to run it at someone else’s pace. Hubbie lent me his gloves and I was off! For some strange reason they had decided to narrow the start gate, meaning that we were walking across it, rather than the usual jog to get going. I don’t know what the thinking was for that. I had decided to run 4:1 run/walk intervals as much as possible, although I knew from experience that I might be walking more on the uphill and running more on the downhill. I managed a couple of straight 4:1 intervals which, considering my fitness, wasn’t bad. I was, of course, hideously under-trained for this event and still carrying bursitis on my hip, with all its associated muscle pains. Funnily enough though, I don’t find running is as painful as walking and the uphill section of the course wasn’t as bad as I’d imagined. It was just under a 13 minute mile, but I was doing alright and I was still running. I was still being caught behind slower runners and walkers. Hubbie told me that some runners held back at the start and went off ages after everyone else in an effort to get a good go at the hill. I can totally understand that. As the road dropped away I started on my faster decent. Almost immediately I was hit by a blast of driven hail. People in front of me were running with their hands up to their faces, trying to gain some respite from the stinging ice. Luckily I’d worn a bandana as well as my woolly hat and managed to pull the bandana up over my nose. The hail was still stinging my eyes, but at least it was away from my face. I found it difficult to breathe through the material though and had to keep dropping the bandana and suffer the hail until I felt I could lift it again. As the road levelled out I felt the effects of the weather and my lack of fitness. I couldn’t see the finish. Usually you can pick it out from way back but, with the weather being so bad, they couldn’t inflate the finish banner. I knew that I wasn’t going to get a PB or even a course PB, so I just went for a finish. My last mile was my fastest in ages at just over 9 minutes. I was really happy with that. I crossed the line in 34:20, finishing (yes, finishing!) in 1528th place and 50th in my age/gender group. I’m actually quite pleased that I wasn’t way off pace. I did the same course last year in 32 minutes odd, so an extra two minutes is nothing, considering my injury. I’ll happily take that. I did suffer a bit afterwards though. I was limping before we even left the field and struggled on and off the bus. I actually took a nap in the afternoon, wearing as much Biofreeze gel as I could! I’m still a bit sore today, mostly quads discomfort though and to be expected. But look! It was worth it for this and my lovely new T-shirt! 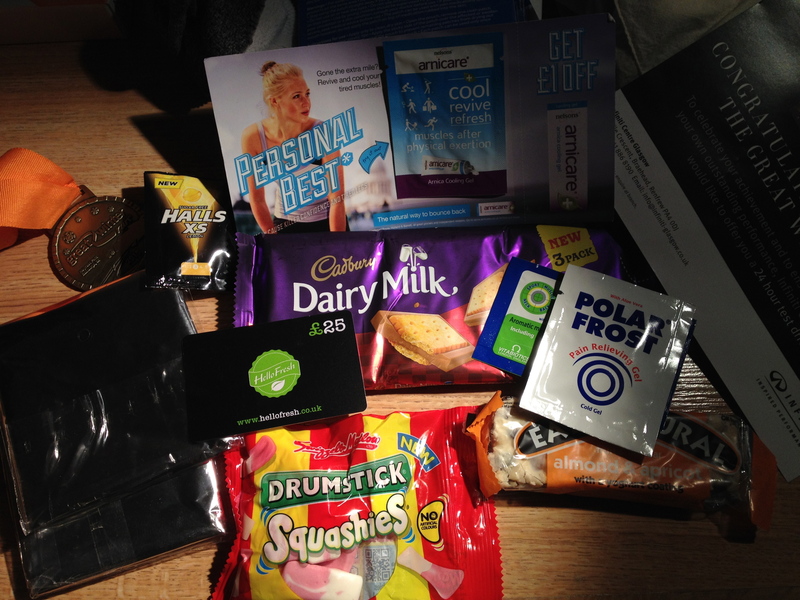 My goodie bag was full of stuff I couldn’t eat (filled with either wheat, nuts or gelatine, or combinations of each! ), but also contained some freeze gels which will be useful I’m sure! All in all, I’m glad I went. The weather was atrocious, but I conquered Arthur’s Seat again and that’s done wonders for my self-esteem. It doesn’t matter how long it took me and one day I will go to Holyrood Park in the peak of fitness. This day I ran despite struggling to walk to and from the park and I think that I should be proud that I ran the best I could. It’s Thursday. Today I went to see my chiropractor who was astonished by my progress since I last saw him just before Christmas. Clearly I not totally out of the woods; I’m still running short distances slowly and leaving two full days for recovery, but I’m much improved. I didn’t, for example, hit the roof when he applied pressure to my knee. He was able to work my IT Band without me swearing – those kind of small, but noticeable improvements. I’ve worked hard, loosening off my IT Band and Sartorius using a combination of a wooden massager from The Body Shop and a battery operated hand held infra-red massager. Icing my lower back and hip has helped reduce the inflammation, but my revelation has been the drinking of Ginger Tea. Ginger is a traditional natural treatment for inflammation, sickness, migraines, high blood pressure, asthma…the list was seemingly endless. Some scientific studies, especially into the effect of ginger on some cancer cells, is astonishing. However, I have been purely interested in using it to reduce inflammation around my hip. I bought some organic ginger and lemon tea bags and have used these in place of the tea I would normally drink during the day. It’s pleasant to drink and I’ve actually stopped having to take ibuprofen. I might just be ‘getting better’, but the coincidence is strong. 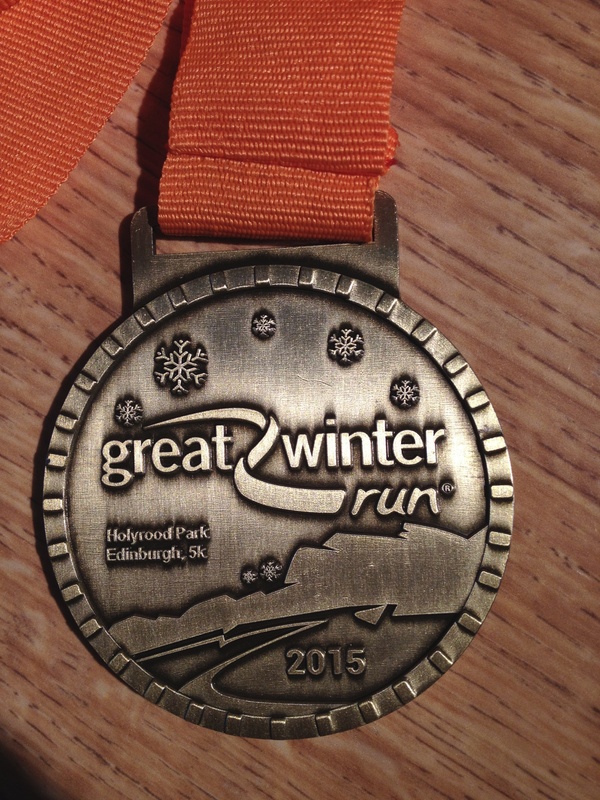 I’ve decided that I will run in Saturday’s Great Winter Run 5k. 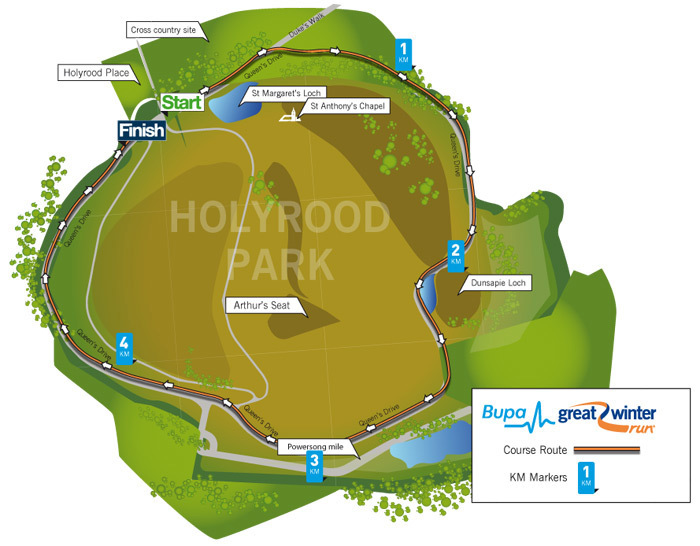 I will again struggle up Arthur’s Seat in Edinburgh’s Holyrood Park, only to hurtle down the other side along with 5000 other mad runners. The weather forecast is chilly and breezy which, translated, means freezing and windy as hell. It’ll be half an hour of madness and I’m looking forward to it. I’ll make it round. It won’t be a startling time, but neither was last year’s with Plantar Fasciitis wreaking havoc. One year I’ll go to Edinburgh in January totally fit! Me and hubby in 2012, crossing the line hand in hand! We had planned to caravan over the weekend, but the weather warnings have meant we’ve had to cancel our booking and find a hotel instead. Not quite what we were looking forward to, but at least I get a rest from cooking and washing up! I’ve never felt more strongly that the old saying ‘one step forward, two steps back’ could apply more adeptly to my situation. From a post of near elation the other day, where I’d finally made tentative running steps on my trusty old treadmill after six weeks of inactivity, I struggled to walk any real distance the following day without that familiar searing pain in my left hip. It stops me dead, that’s how sore it is. I’ve been caught within sight of the car and unable to move any further towards it without several rests and tears streaming down my face. It’s no joke. But today, after a few days of rest and recuperation, I feel well enough to give another short run a try. I’m nothing if not determined; I will get back on track. I’m actually thinking of a two mile trail run with my faithful running partner, Murphy Dog, and, if I can persuade him, my hubbie. Having hubbie there will restrict my speed and stop me from doing anything silly. Last year I ran 473 miles. I had wanted to round that up to 500 by Hogmanay, but it wasn’t to be. 473 was my total and I’m proud of that. I’ve run further in a year and trained for less races, but it’s not the quantity that’s important anymore, it’s the quality. 2014 was a strange running year for me. I started the year with Plantar Fasciitis, which took an age to heal, and then picked up various injuries as I trained for three half marathons. I’d planned on a few more shorter races, but injuries and illnesses got in the way and I managed only a 5k and a 10k at either end of the season. 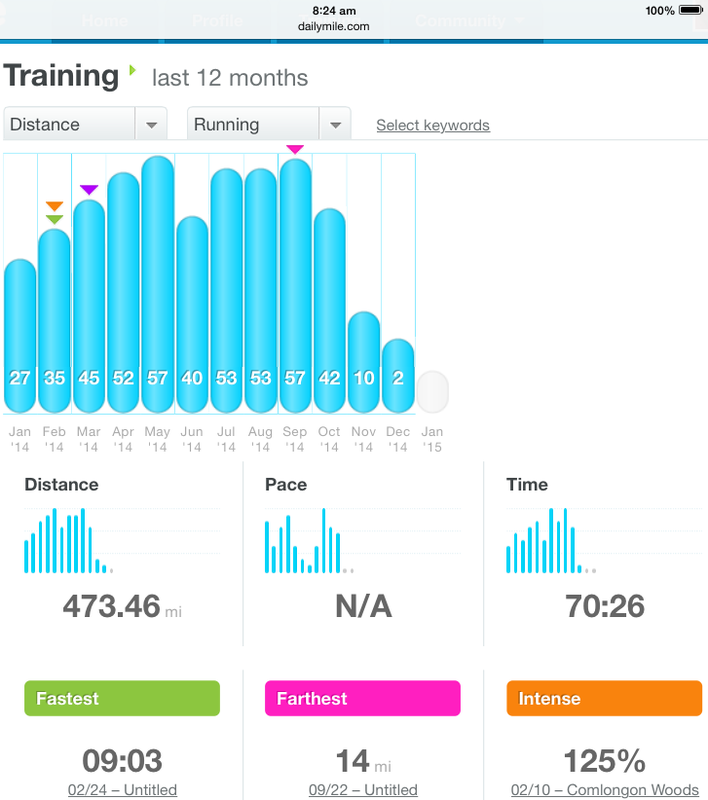 I learned to listen to my body and opt out of races, missing two 10ks in mid-season. It took me a couple of frightening asthma attacks to start listening, but I got there. I finished the year with Bursitis on the hip, taking me into 2015 with a wince and a limp. I’ve no idea what 2015 has in store for me, it’s probably better that I don’t know. I have decided to scale things down a bit though and just aim for one half marathon in October and concentrate more on improving my speed over shorter distances. I’ll be looking at more 5k and 10k races and I’m looking at some trail races too. Maybe I just overdid things last year and I’m paying the price now. I do vow to enjoy running in 2015, it’s the only resolution I’m making. Running with a smile has to be better than running with a grimace!